Threadless announced that they are now offering Threadless brand t-shirts exclusively on new designs. The t-shirts come in four new sizes for the little and the big including XS for girls and guys and 3XL for guys. The different colors haven’t all been released yet but should be arriving in the next few months. Threadless now offers their branded shirts for guys and girls in short and long sleeves as well hoodies and shirt for kids. The Threadless custom t-shirts are custom cut 100% ring spun combed cotton.The prices will vary depending upon the size, printing and decoration technique but start at $15. 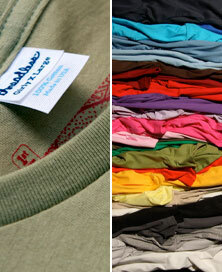 The remaining other garment brands that Threadless offers include Fruit of the Loom and American Apparel. Check out the size chart for more information on the new Threadless brand garmets. I am looking forward to trying these out. I am mainly interested in the feel and the fit of them. I hope it works out for them.